A Review of Assessing the Turkish Model: The Modernization Trajectory of Turkey through the lens of the Multiple Modernities Paradigm, by Oğuzhan Göksel. Oğuzhan Göksel’s thesis looks at the “Turkish Model” concept and the debates that revolve around it from the perspective of modernization studies. It challenges established approaches to the Turkish model that come from the field of modernization studies itself. Alternatively, it employs the Multiple Modernities Paradigm (MMP) to provide a more nuanced and accurate account of the Turkish Model thus “showing that modernisation in this non-Western [Turkish] society has been a complex phenomenon that produced a divergent ‘modernity’ rather than converging towards Western values such as liberal democracy” (p. 29). The thesis is divided into seven chapters. Chapter one reviews the existing literature and addresses issues of research and methodology. Importantly, it identifies two main conceptualisations of the Turkish model in the literature, which the author terms the “structural model” and the “societal model.” The former model has been influenced by Classical Modernization Theory (CMT) while the latter by Neo-Modernization Theory (NMT). This classification allows the author to justify his choice to use the MMP and lays the foundations for the analysis that follows. As opposed to CMT, which generally posits that Turkey owes its modernization to the Kemalist secularization program and the state-led development, and to NMT, that emphasizes the role of social forces, economic liberalization and the reformist interpretation of Islam, MMP facilitates the study of the origins of “Turkish modernity as a whole by tracing the trajectory of economic, socio-political and institutional development processes” (p. 28). Chapter two defines modernity and modernization and fleshes out further the alternative paradigm of MMP while explaining why it is a more suitable theoretical framework for the analysis of Turkish modernization and the Turkish Model. Among other things, the chapter scrutinizes and challenges the established understandings of CMT and NMT in terms of the positive correlation between economic development and democratization, and their Eurocentric-deterministic approaches. MMP, the author explains, goes beyond the discourses of “Western cultural hegemony” (p. 95); it employs analytical tools such as historical contingency and path dependency as well as the role of the international context thus providing a more non-deterministic approach to non-Western case studies and Turkey in particular. Given that all three schools of modernization in question (CMT, NMT and MMP) agree that modernization is defined as the economic, political and social development experience of a society, in chapters three to five the author builds his argument upon these three aspects (economic, political, and social development), respectively. Therefore, chapter three focuses on the aspect of economic modernization. Unlike CMT and NMT, where economic modernity is associated with liberal free market and capitalist economy, an economically modern society in MMP is one that is “industrialised, urban and literate with effective economic policy-making and an advanced infrastructure in transportation and communication mechanisms” (p. 102). Based on these criteria and with the help of the MMP methodological tools that track economic modernity from the foundation of Turkish Republic, the chapter argues that Turkey is indeed a modern economy which, however, differs from the Western economic model. Following the same logic, chapter four looks at the political trajectory of Turkey’s modernity, namely its democratization process. Contrary to CMT and NMT arguments, this chapter demonstrates how Turkish modernity diverged from the Western path to modernity; an outcome that was influenced by the military’s political role as well as the different time period during which Turkish modernity evolved in relation to the Western one. Furthermore, the chapter challenges the propositions of the structural and societal models making the case that the Kemalist secularization programme, economic liberalization and the post-1980 Islamic political movement did not, in fact, consolidate liberal democracy in Turkey. In the next chapter, the social trajectory of Turkish modernity is examined. Here the author pays attention to the role of religion and Islam in particular. In this instance MMP provides a more balanced, one could argue, reading of the relationship between religion and modernity than its contestant theories. MMP does not presuppose a negative or positive linkage like CMT and NMT do, respectively. From this perspective the author manages to open up the “black box” of religion and treat Islam and the Islamic movement as a non-monolithic object of analysis. To do that, chapter five looks at the role of the political-economic conditions that impact religious interpretation and thus social transformation. The historical account that the author provides once again proves particularly helpful as it demonstrates the centrality of the interaction between the state and the Islamic movement, the transformation of the state itself and the relationship between the post-1980 political and economic “opportunity.” The chapter concludes by identifying the weaknesses especially of the CMT even as it argues that according to the NMT and MMP criteria Turkey can be considered socially modern, albeit NMT disregards the role of political development and focuses only on the economic one. The “multiple Islamisms hypothesis” (p. 297) that the thesis adopts is indeed a less simplistic and more accurate conceptualization of the relationship between Islam and modernity. Chapter six draws upon the analysis that preceded to test the hypotheses of modernity theories, highlighting the added value of the Multiple Modernities Paradigm framework. Emphasis is given to the ability of MMP to be non-deterministic, to track the diverging trajectory of Turkish modernity vis-à-vis the Western model and identify the factors that subvertedit to that direction. The analysis is complemented by detailed tables for each trajectory of Turkish modernization – economic, political, and social. Chapter seven summarizes the aims, methods and conclusions of the thesis. Overall, Oğuzhan Göksel’s thesis is a well-structured and very systematic analysis of Turkish modernization and what is often referred to as Turkish model. It makes for a significant contribution to both modernization studies and Turkish studies, to say the least. It offers a non-simplistic, non-deterministic, multileveled and multidimensional analysis which provides a more holistic understanding of the trajectory of Turkish modernization than other theories. One that can also account for today’s socio-political reality in Turkey and its complex dynamics, at a time when developments of historic importance are taking place along with transformations at the economic, political, social and ideological level. Durham University. 2015. 373 pp. Primary Advisors: Emma C. Murphy and Colin P. Turner. 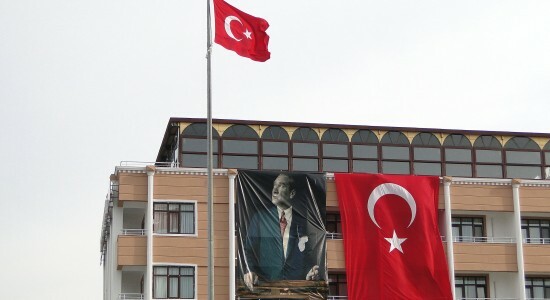 Image: Facade with Turkish flags and image of Atatürk. Wikimedia Commons.